Right from the start, the Fiat 500 has followed in the shadow of the Mini. BMW's marketing of its Mini has been brilliant  a slick message, bright colours, a retro style that is modern at the same time, a big variety of inexpensive options that allow personalisation. It became a fashion item and so could command a price premium, setting it above the crowd. Fiat adopted exactly the same formula for the 500, albeit at a lower price point, and it was a similar success. So, when Mini has completely out-grown its name by introducing the 4.1m Countryman, we can see the logic of Fiat producing the 500L. It is 5cm longer and 10cm taller than the Countryman but presented as a compact five-seat MPV, whereas the big Mini sees itself as an SUV crossover. The mission is the same  to provide a more spacious model to which buyers of the original can graduate. Fiat is keen to cultivate the enthusiasm generated by its most successful current model but has stopped short of making 500 a separate brand with its own sales organisation, like Mini. The L stands for Large  too large for the platform that underpins the original 500, the Fiat Panda, Ford Ka and Lancia Ypsilon. Instead, the 500L is built - at the former Zastava (Yugo) factory in Serbia - on a modified Punto Evo platform which Fiat calls Small Wide and which will be used for a variety of future Fiat, Chrysler and Jeep products. As such, it is technically an entirely conventional front-wheel drive car, offered with the 875cc TwinAir and 1.4-litre four-cylinder petrol engines, and a 1.3-litre diesel, with a 1.6-litre diesel to follow. Roberto Giolito, the engaging Fiat design chief and 'father' of the 500, has a convincing explanation of how the 500L has evolved from the small original and even the original rear-engined Multipla from the 1960. But to most onlookers this is a car with a slightly awkward style, adding an enlarged version of the 500's smiling face to a boxy, slab-sided rear end. Pretty, it isn't  but then neither is the Countryman. Next year's seven-seat 500XL, which is 20cm longer on the same 261cm wheelbase, won't be more elegant but a glimpse of the 2013 500X SUV (the replacement for the Suzuki-based Fiat Sedici) suggested that will have a more pleasing shape and style. Let's not forget that the 500L is an MPV, which means that the emphasis is, as it should be, on a spacious and adaptable interior. There, inside the car, the impression is much more favourable. Giolito likes to refer to it as a light and airy living room. The use of painted body colour across the facia, surrounding the instruments and control panel is particularly effective in a white car with a black roof and upper structure (the colour scheme for the 'opening edition'). All round visibility is good, thanks to twin screen pillars forming a useful quarter-light ahead of the doors and the inset extra side window at the back. Everyone on board will enjoy the one-piece tinted glass panoramic roof  a worthwhile extra. The rear seats slide back and forth, to increase legroom or luggage area, and fold and flip forward at the single touch of a lever; they were designed to ease entry to the rear compartment of the seven-seat XL but it was decided to fit them on all models. The front passenger seat can also be folded flat, so that long objects can be carried  or it can be used as a laptop table. The luggage compartment floor can be at three different levels and around the car there are 22 storage areas for oddments, large and small. A huge variety of available colour schemes and trim options is available, some garish, others quite sophisticated. Unusual, perhaps unique, is a Lavazza expresso coffee machine that plugs into a docking station in one of the cup holders. Cabin ambience is generally good but Fiat's current obsession with 'quercle', a kind of squared-off circle, is disconcerting when it comes to the steering wheel which is usually in two colours and looks as if the leather rim covering hasn't been put on properly. The steering wheel brings us to the driver, too often the last person to be considered when designing a family MPV. Can the tall and enlarged 500L match the agility and driving fun of the little 500? The answer is no, but compared with competitor MPVs of similar size, the 500L is better than average to drive. The steering, with electric power assistance, is light and easy if not very communicative and the car corners with confidence and not too much body roll. Perhaps inevitably, as a tall car that is relatively stiff in roll, the ride over small bumps and broken road surfaces is jittery. The best performance comes from the 105PS two-cylinder TwinAir petrol engine but its sound and curious torque characteristics are not to everyone's taste. As with the latest Panda, we preferred the 1.4-litre four-cylinder FIRE engine, with 95PS, which is not much slower. 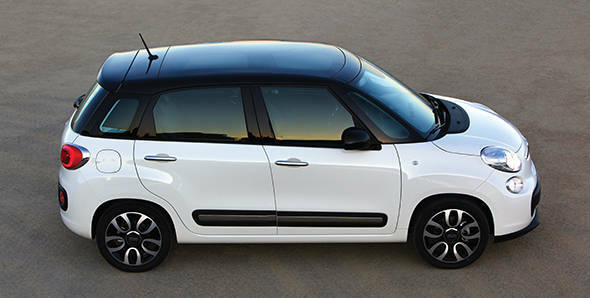 The 500L may need bigger and more powerful engines for the USA, where it will become the second car in the Fiat range. The smaller 500 is supplied from Mexico but the 500L for the US will come from Serbia. Although it is large for a 500, this is a very small MPV in American terms and it is far from sure that it will find a receptive audience. The sales job will be easier in most of the other 100 countries where it will be marketed. Whether it will come to India has not yet been decided but it seems likely as the idea is to build up the 500 family all over the world. As Olivier Francois, head of the Fiat brand, said at the car's introduction in Turin: 'The 500's DNA indicates the future of the Fiat brand'.